Episode 189 – More Than Four Hours?! In this episode, Vespertilio is back for a solo show. He talks about what he has been doing in game this season and in the PTR. Wait.. he actually still plays Diablo 3? Tune in to find out for sure! Later in this episode he discusses his own opinion on what is going on in the Diablo official forums. * Vesperilio talks about what he has been up to in game. * We, here at the Shattered Soulstone, have a Blizzcon 2018 Goodie Bag up for raffle! If you want to join, tune in to find out how! * Vespertilio shares his opinion on what is going on in the Diablo community forums. In this episode, Jen brings in a special guest who is a big part of the Shattered Soulstone podcast. Shawn is the editor of Shattered Soulstone who ensures that our podcast sounds good. We discuss the “behind the scenes” of podcasting and point out what happens between when the hosts hit the record button and you hit the play button. We also reviewed what we have been up to in Diablo III. The two of us have been playing the game together until one of our characters died. * We read tweets from @hpbotha and Lanntonio. Got something to say? 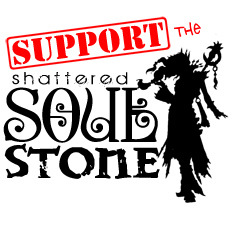 Tweet @ShatteredStone and we will read and respond to your tweet in our next episode. Check out Audible for your FREE, no obligation 30 day trial including a free 1 credit book. Go to bit.ly/soulstone2016 to start your trial today! * We didn’t get any emails this time. You can send your thoughts, questions, comments, and stories about what you have been up to in Diablo III to show@shatteredsoulstone.com. We will be happy to read it and share our thoughts about it in our next episode. * Turret posted “Patch 2.4.2 PTR Patch Notes”. It is preliminary PTR patch notes. It isn’t the final version and some changes may still be made to it. * Nevalistis posted “Patch 2.4.2 PTR Now Available”. This helpful post walks you through how to participate in the PTR and how to copy a character over to it. * Nevalistis posted that “Play Your Way Returns June 23!” It will occur every other Thursday. Did you create a fun build that you want to show off? Submit it to “Play Your Way”. * Nevalistis posted a Forum Post called “The Future of Firebird’s Finery”. In short, they aren’t done working on changes to it yet. You can add your thoughts about it to the PTR Feedback Forum. * Nevalistis responds to a Forum Post titled “Location of Kahara (Fallen) Pennant?”. In short, the Diablo team is aware that the pennant is too rare and are intending to slightly increase its drop rate. Doing so requires a patch. * Jay Wilson tweeted that he is leaving Blizzard and the games industry. Almost immediately following us wrapping up episode 32 we were treated with the fabled preview blog of patch 1.0.7. Unfortunately for us that meant a HUGE nugget of really important information would have to wait until our next recording session in late January. Given the depth and importance of the changes being previewed, letting this information languish until then sure didn’t feel like a good idea. So then it dawned on us, why not utilize our Mumble server and open up a round table discussion about patch 1.0.7 with you, the listener? Good idea, right? We sure think so. By holding a community round table we can get more opinions and impressions of the changes coming in 1.0.7 from a wider variety of perspectives. This also allows us to be more timely with discussing this information while not bogging down our next episode with lots of 1.0.7 talk. Oh sure, we’re certain the discussion will continue well in to the next couple of episodes, but we can all agree that a 2+ hour MEGA show would be unwieldy for everyone. So instead we’re going to try out a separate round table format and see how it is received. Okay, so with all that being said, how do you, the listener, participate? As previously stated, we’re going to be holding this patch 1.0.7 round table on Mumble, so make sure you have Mumble installed on your computer and go through the audio setup wizard if you haven’t already done so. (The wizard is pretty easy to follow and shouldn’t take more than a couple of minutes to complete). Next step is to check out the Patch 1.0.7 Preview Blog by Mr. Wizard-Hater errr I mean Wyatt Cheng OR the Patch 1.0.7 patch notes (which may or may not be updated and changed as the week progresses). You needn’t download the Diablo 3 Patch 1.0.7 PTR client, but by all means do so if you want to check out the changes for yourself. Hopefully the PTR will be stable enough for some of us to have some first-hand experience with the changes, but we also want to have an “outside-looking-in” perspective on the round table as well. So when will we be holding this Patch 1.0.7 Round Table? Make sure you clear your calendars on Friday, January 18th at 6pm Pacific / 9pm Eastern. More than likely we won’t start EXACTLY at this time as some “pre-show” will definitely occur to loosen everyone up. If this round table format works out well we’ll be sure to revisit it with substantial patches in the future. In this episode, we’re down our 4th musketeer due to work obligations that Lanntonio couldn’t get out of. That’s okay, Nevik, Breja and Jen still convened to discuss what we’ve been up to since our last show: Nevik took a vacation in panda-land, Jen’s altoholic nature reared it’s head again, and Breja finally puked his way to 60! * Well, would you look at that. According to the calendar the show will be a year old come October 12th. Can you believe it? The year has really flown by. We reminisce about how the show came together and celebrate how well the show has done thanks to you, our wonderful listeners. * We read, and respond to, the emails we’ve received from our wonderful listeners. This batch came from: Chad and Tensor. Thank you for your emails! Keep them coming! * Nevik discusses the reasons as to why he took a step back from the game, ie. the great wizard nerf(s) and the growing frustration with the lack of communication from the development team as their vision for what direction they’re taking the wizard in. * Tensor provided us a link to his wizard’s profile as well as his former ranged nuke wizard build and his tenative critical mass – melee wizard build. * Blizzard’s Customer Service department is changing their hours of operation. Check out the official blog post detailing the changes. * A couple of new builds have been deployed to the 1.0.5 PTR. Check out the latest patch notes to see what has changed since the PTR went live. In this episode, the full cast is back to mourn the departure of our friends leaving for the mystical lands of anthropomorphic pandas. After a brief moment of silence (we’re kidding, we didn’t really) we get back on topic and discuss what we have been up to in-game: Breja’s new job allowed little time to play, Lanntonio has waffled once more and is back on his wizard, and [Cue triumphant trumpets] Jen downed Diablo with her barbarian and Nevik finally cleared Inferno! * We slip a little bit of Diablo news in before reading your emails to discuss the new system, Monster Power, and what we might expect from it. * We read, and respond to, the emails we’ve received from our wonderful listeners. This batch came from: Master Do, Darksoul, Commander Bird and Torhammer. Thank you for your emails! Keep them coming! * We bare the intimate details of our … *ahem* rigs that we play Diablo 3 on. * Prompted by your emails, we discuss numerous aspects that has us excited about the upcoming Patch 1.0.5 as well as a few that make us #sadpandas. For more details on Patch 1.0.5 check out the official patch notes. * Speaking of Patch 1.0.5, the PTR (Public Test Realm) went live on Friday — and then brought back down over the weekend — so we discuss what to expect from the PTR. If you’d like to participate in the PTR, follow these links for instructions on How to Download the PTR Client and How to Copy a Character from the Live Servers. * We reference an interview with Jay Wilson and Wyatt Cheng over at PC Gamer. There we a lot of interesting questions answered so we recommend that you check out the interview for further juicy tidbits. * Darksoul provided us a link to his profile so you can check out his melee wizard build. * Nevik and Lanntonio talk a little about the data-mined information about the Infernal Machine and it’s reward the legendary Hellfire rings coming in 1.0.5. For more detail, head over to this post at Diablofans.com. * Nevik mentions that he tried out and subsequently fell in love with the Archon-explosion wizard build. Here’s a link to the skill calculator highlighting the skills for this REDONKULOUS build. * Nevik also mentions a guide by eLINminatior on the official Diablo 3 forums which details the Sustained Archon wizard build being used by more and more top-end wizards. It has exceptionally high gear requirements, but you too can check it out and dream like Nevik about face-rolling demons with this build.